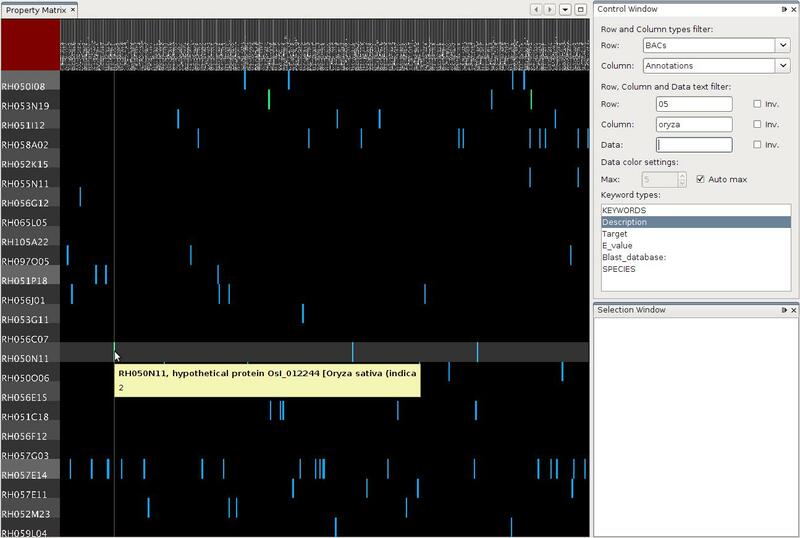 The property matrix visualization is designed to explore the relations between data elements of a genome size dataset. It gives the user the freedom to cross-reference low and high level data, providing a versatile environment to explore a wide range of data properties. Filter options allow the user to focus on specific data attributes, while grouping algorithms provide means to find similarities between data elements. The property matrix supports high level data elements like genome, chromosomes, BINs, and BACs and low level data elements like annotation types and annotation attributes. The matrix provides a framework to cross-reference any combination of data elements and assures a uniform visualization. Cross referencing high level with high level data provides information about the shared low level information. Cross-referencing low level with low level data provides information about common high level data. Cross-referencing high level with low level data provides an overview of occurrences of low level data elements in high level data elements. The visualization has been applied on the 'BAC by BAC' sequencing results from the Potato Genome Sequencing Consortium. Visualization of potato genome sequencing data, Remko B.J. van Brakel, master thesis TU/e, june 2009.